Why Is My Goldfish Not Eating? Feeding time can be a particularly pleasant time to be a goldfish owner. The event makes goldfish particularly happy, and they'll often be waiting for you, wiggling in eager anticipation of their meal. With a little patience and practice, you can train your goldfish to eat out of your hand. Goldfish are usually quite happy to devour everything in sight that is edible, so when they show no interest in food, it's usually a sign that something is wrong. Swimming Askew: Look for clues as to why your goldfish is not eating. 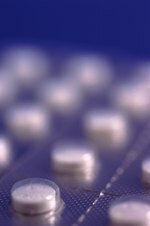 If he's rolling onto his side, swimming sideways, or floating upside down, he could have swim bladder disease from overeating at a previous feeding. The swim bladder is a gas-filled sac just off of the digestive tube that helps the fish balance upright in the water and maintain his desired depth. When a fish overeats, develops fat around his organs, or gets constipated, other organs can press on the swim bladder, throwing off his equilibrium. Solution: Don't feed your fish for 48 hours to let the digestive system clear out. If he is still swimming askew, see if he will eat a peeled, cooked pea rich in fiber that can help things along. 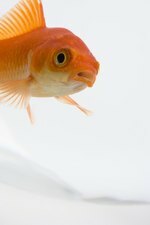 Constipation: If your goldfish is staying at the bottom of the tank, he might be constipated. A constipated fish will scoot along the bottom of the aquarium when startled rather than taking off and swimming into the water. Solution: A cooked pea can help the situation, but if your aquarium fish is not eating, you can leave him without food for 48 hours to let things move along naturally. Poor water quality is perhaps the leading cause of all goldfish issues. The fish prefer cooler water— around 74 degrees—than tropical fish. Goldfish also put out more excrement than tropical fish, which translates to the risk of higher nitrate levels that can cause them to feel poorly. Use your aquarium test kit to make sure the ammonia and nitrite levels are at zero and your nitrate levels haven't exceeded healthy levels. A partial water change might be all it takes to give a goldfish back her appetite. 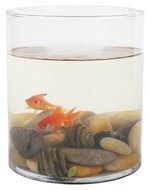 If you're keeping a goldfish in a bowl, upsize the environment to a 40-gallon aquarium for the first fish and 20 gallons for each additional fish. Most new goldfish owners don't realize that their new pet can grow to more than 18 inches long and end up weighing 10 pounds. Make sure the filter can handle the nitrate load your fish puts out. It's better to have slightly overfiltered water than not enough, as your fish can die quickly if ammonia levels start to build up in the tank. A goldfish with a red belly sitting on the bottom of the tank is likely suffering from poisoning from poor water quality. A red belly indicates potential internal bleeding, which is nearly always fatal. Like any creature, a goldfish not eating can be expressing taste preferences or that he's tired of eating the same thing over and over. Fresh romaine lettuce, spinach, or kale kept in the tank in a vegetable clip can offer your fish forage like he'd find in the wild. Small animal-sourced food can also offer a variety, such as freeze-dried brine shrimp or small crickets. If your goldfish is not eating and seems perfectly normal otherwise, and your water quality is good, then don't worry. Goldfish can go for weeks without eating without any adverse effects to their health. Observe your fish for any signs of distress.